Location of the property, i.e. in an open hill or in a valley. Steepness of the roof, the steeper the better, the faster the rain will run off of it and the longer the roof will last. Tree coverage, over hanging trees will wear the roof out quicker and will also help moss to get a hold . The quality of the material used to thatch the roof originally. The type of material used is essential, making sure the material used is the best to suit the style of property being thatched. Has the roof has been well maintained in the past? I.E Have the ridges been re-placed when needed. Sometimes people can be ‘a penny wise and a pound foolish’ when comes to ridges, leaving them too long could damage the coat work. The most important factor is the quality of the craftsmanship. A rough guide of the life of a thatched roof is about 25/30 years for coat work and 10/15 years for the ridge. However, this is a rough guide. I have seen roofs much older than this, some much younger, it all depends on the factors above. How do I choose a Thatcher? There are several points to be aware of. The best things to do when choosing a Thatcher is look into past work they have done, and not just the last few jobs they have done, ask for older jobs and go to see how they look after a few years of weathering. When the Thatcher turns up to your property make sure they put a ladder on the roof to check the roof properly. 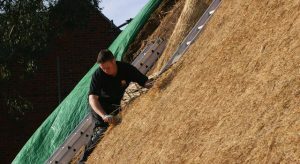 They should part the thatch and check the depth of the bonds, the state of the thatch can be checked at this stage too. The state of the thatch can be much better sometimes under the moss and grime than it looks from the ground, sometimes it is impossible to tell from the ground. The thatch may still have plenty of life in it and you only need a ridge, shear down and tidy up, this can be much cheaper than re-thatching the entire roof. Also, if the thatcher does not get up on the roof they cannot possibly measure the height of the roof accurately. If they just measure the length of the building and guess the height of the roof they will more than likely be inaccurate, they will always over guess it. Please do not be taken in by the old ,they will try and tell you they have done it for years and do not need to get on the roof. This is just being lazy and if they want to cut corners here at the first stage of the job they will cut corners when thatching. If you went to a garage with your car and parked it outside, and the mechanic did not go out and take a look at your car and just said its your big end mate that will be £800. You would either ask him to have a look first or more than likely go somewhere else. It is essential that the thatcher should when possible check the internal roof structure to. 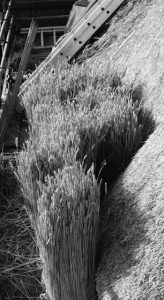 Make sure the Thatcher is going to be the one doing the thatching and over seeing the whole job and not just freelance it out to other thatchers. If they are freelancing the work out ask to see the freelancers past work and make sure the guarantees still stands. The final important point is to make sure you have a good rapport with the thatcher that you choose they will be at your property for quiet a while it will be much nicer for you if you both get on well .